There’s something a bit surreal about the Granites. Where some of the boulders that scatter the site look like they could roll away like marbles at any minute, others sit firmly like Colossi, keeping watch over the sandy landscape. But it’s when the sky goes dusky, or the rain rolls over the breakaways that the vivid colours of the Granites can be truly appreciated. It is these – the colours, the Granites, and the people who are their custodians – that were in focus at a three-day arts and language workshop in late April 2016. 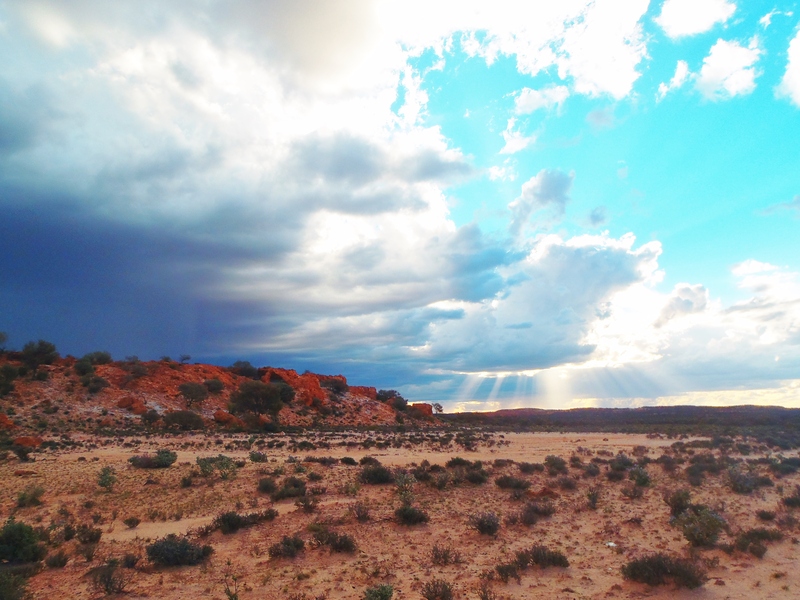 Located approximately 7 km north of the town of Mount Magnet in the Mid West region of Western Australia, the Granites is a registered Aboriginal heritage site of significance to the Badimia People. The site contains a number of significant natural and heritage features including striking granite formations, artefact scatters and engraved and painted rock-art. The Badimia People who are the Traditional Owners and custodians of the Granites have been actively developing conservation and management strategies aimed at protecting and promoting this important site. As part of this process a cultural heritage interpretation plan was developed in 2015 which identified the need for appropriate interpretation of the site in the form of art and stories. 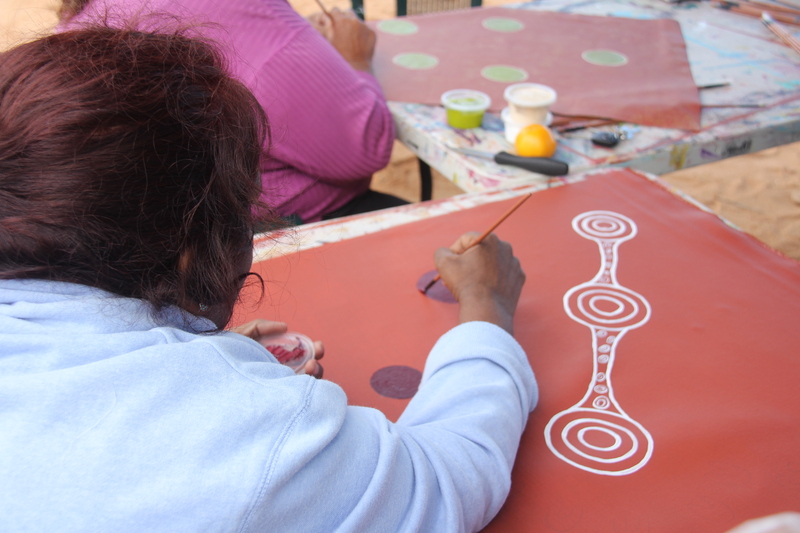 The ‘Arts of the Granites’ project was a community developed project, funded by a Commonwealth Department of Communications and the Arts grant, as part of their Indigenous Languages and Arts program. The project aimed to get people out on country to facilitate intergenerational knowledge transfer, paint artworks relating to The Granites, and to record stories and language associated with The Granites which could also be used in the proposed interpretation of the place. 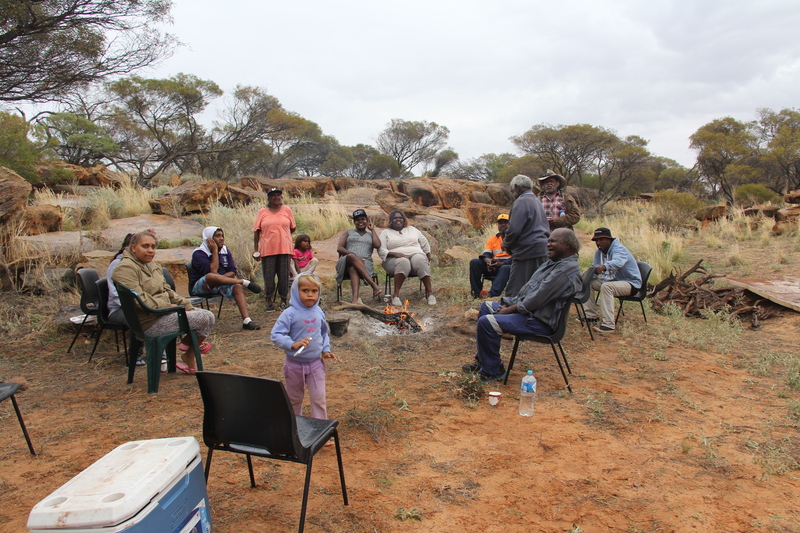 Held from the 26 to the 28 April 2016 in Mount Magnet, the project was facilitated by the Badimia Land Aboriginal Corporation, Terra Rosa Consulting and linguists from the Bundiyarra Irra Wangga Language Centre. In those three days, art and language workshops were facilitated by community elders Ollie George, Frank Walsh Snr. and Annie Walsh. 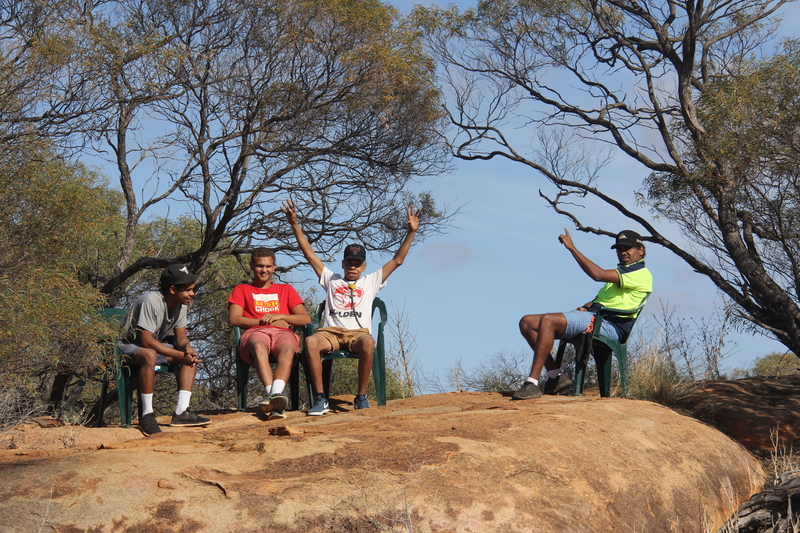 The first two days were spent on country at the Granites and the final day was spent at the Wirnda Barna Aboriginal Artists (Inc.) art centre in Mount Magnet. 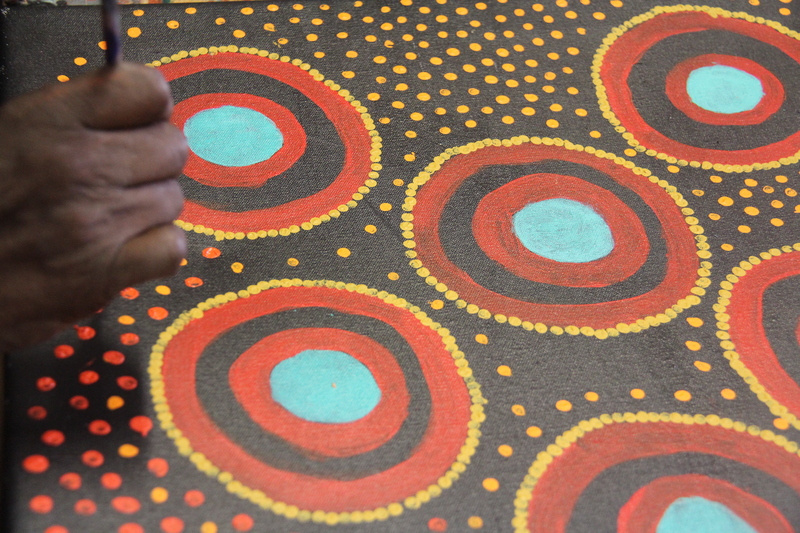 Wirnda Barna supports and represents Aboriginal artists from the communities of Yalgoo, Mount Magnet, Sandstone, Cue, Meekatharra and Yulga Jinna. You can visit the Wirnda Barna website via the following link: http://www.wirndabarna.com.au. 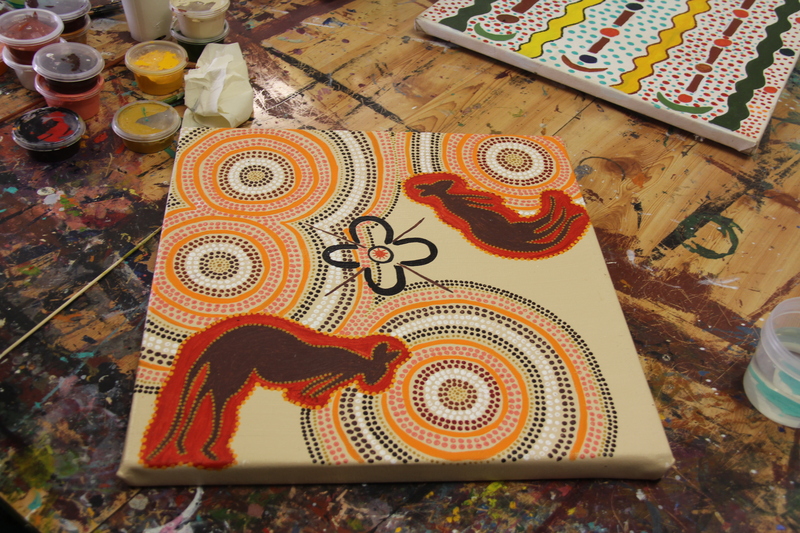 The paintings created as part of this project will be displayed at an upcoming exhibition at the Kidogo Arthouse in Fremantle from 9 to 22 June 2016, entitled ‘Winda Barna’. You can visit the Kidogo website at: http://www.kidogo.com.au. 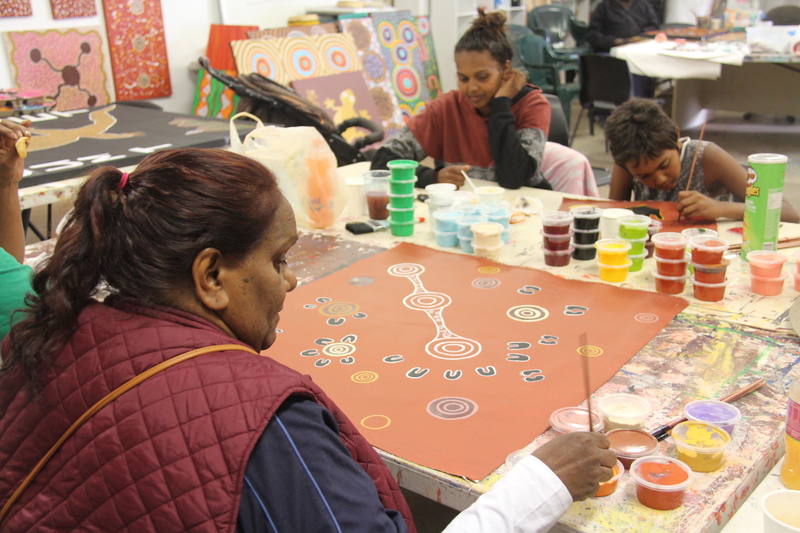 All of the artists who participated in the workshops came from Mount Magnet and Yalgoo. During the workshop the artists were consulted to develop mini-biographies and to record the symbolism and meaning of the paintings. The majority of the paintings were inspired by the Granites and the gathering of all the people at the site to participate in the project, though the story of the Seven Sisters, who stopped at a place about 60 km from Mount Magnet during their northwards journey, was also a popular subject for the artists. 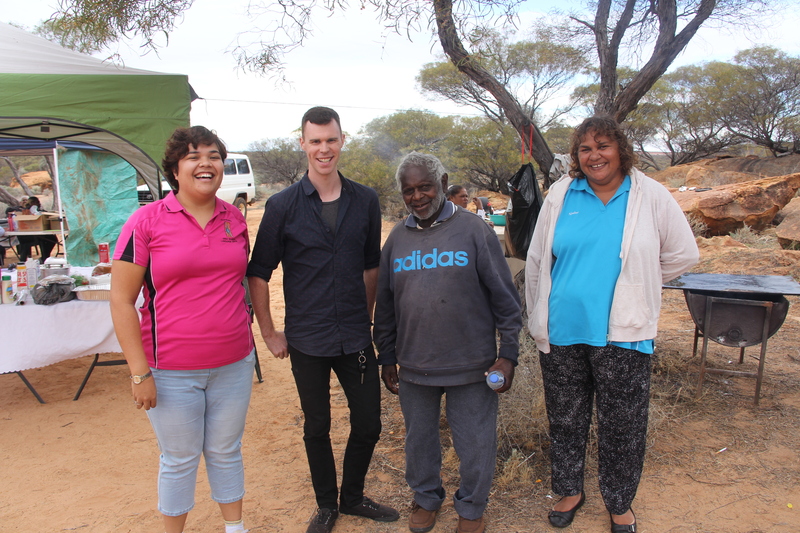 During the project the linguists from Bundiyarra took community elder Ollie George around the site and other places of cultural significance in the local area to record language, ethnobotanical information and stories relating to the Granites. Ollie also recorded a Welcome to Country in Badimia language which will be used in the upgrades proposed for the site. Overall, the workshops were very well received in the community and there was a significantly larger turnout than expected on each of the days! People who had never painted before picked up a brush to have a go, and experienced ladies were present to teach and inspire them. 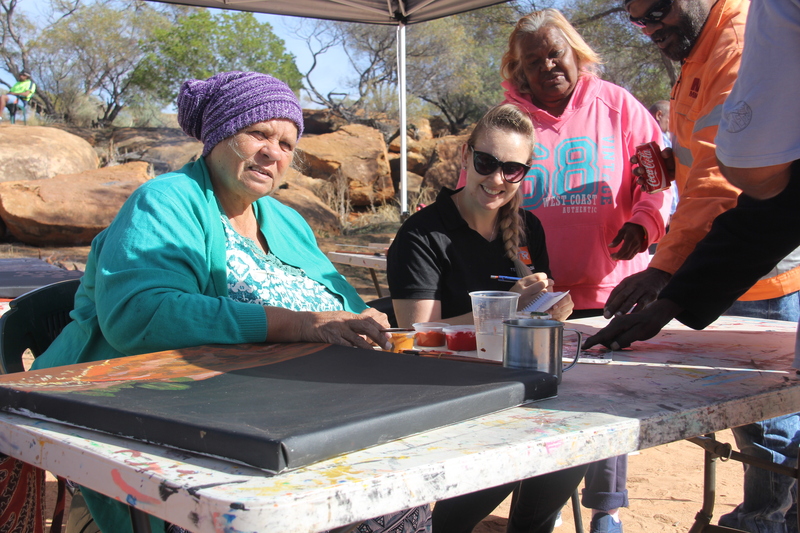 By bringing everyone together on country to paint, yarn and cook, at least four generations of Badimia people were given the opportunity to share stories and cultural knowledge about the Granites and paint the vivid colours cast by the rolling rain clouds. Enjoying the sun at the ‘Arts of the Granites’ workshops! The paintings created as part of this project will be displayed at an upcoming exhibition at the Kidogo Arthouse in Fremantle from 9 to 22 June 2016, entitled ‘Winda Barna’. You can visit the Kidogo website at: http://www.kidogo.com.au.